This colorful mix of vegetables makes an ideal accompaniment to chicken, beef fish, or pork, given the roasting brings out the natural sweetness and intense flavors of vegetables. They're a perfect side dish throughout the whole year, whether Spring, Summer, or Fall, but there's just something comforting about having a big dish full of roasted vegetables during the holiday season, particularly next to prime rib, roasted turkey, or baked ham. Another bonus: Roasting the vegetables all in one baking sheet saves on cleanup, too, which is always a big plus when you're making a big dinner. Spray a large baking pan or ovenproof dish with nonstick cooking spray. Arrange cut vegetables in dish and drizzle with olive oil. Add rosemary sprigs and season with pepper. Roast vegetables for 20 minutes, or until the tops are slightly browned and crispy. Remove from oven and turn vegetables over. Roast for an additional 20 minutes, or until vegetables are tender and slightly browned. Make sure the vegetables are fully coated with olive oil. If some seem to be dry still, add another tablespoon. However, don't use too much, or the veggies will turn out greasy. Different vegetables cook at different speeds. 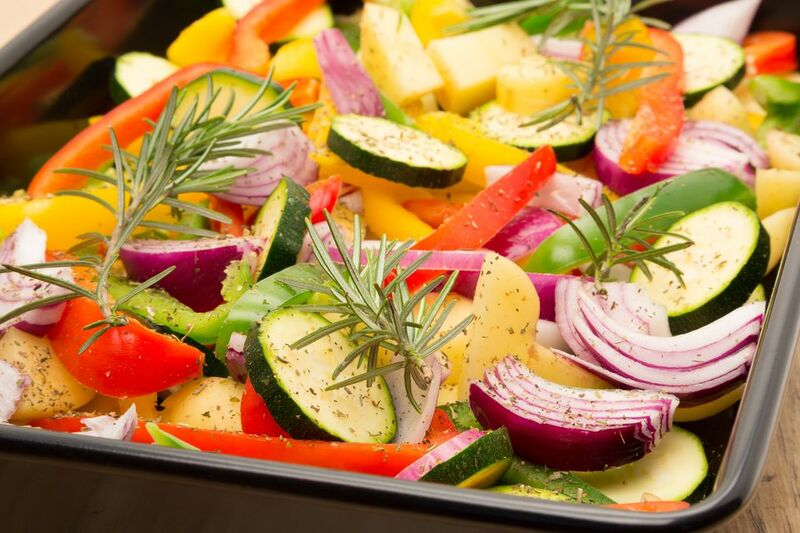 If you are OK with certain vegetables being more cooked than others, put them all in the oven at the same time. If you want them to all be at the same level of doneness, put the onions, potatoes, and parsnips in the oven first. Once those are partially cooked, add the carrots, zucchini, garlic, and red bell pepper. Use the roasted vegetables in myriad ways beyond a simple side dish. Put them on top of a pizza before cooking it in the oven, add it to a quesadilla or taco, or stir them into a cold or hot pasta dish. This recipe can be made with any type of vegetable you have lying around, including winter squash, broccoli, cauliflower, tomatoes, or celery. Add a sprinkle of cheese to the finished product, and let the residual heat from the vegetables melt the cheese. Consider goat cheese, blue cheese, or feta cheese. Cranberry and pecan variation: Add 1 cup fresh cranberries and 1 cup chopped pecans to the mixture before arranging on the baking sheet. Let the fruit and nuts roast alongside the vegetables. Sweet and spicy variation: Put all the vegetables in a mixing bowl and add 1 tablespoon harissa paste and 1/4 cup pure maple syrup. Toss to combine. If you don't have harissa handy, add 1 tablespoon red pepper flakes or sriracha. Antipasti variation: Chill the roasted vegetables before serving them on a wooden cutting board with an assortment of cheese, cured meats, and crackers.